Had a blast this past weekend with fellow Hobie Outback owner and friend Joe Underwood and his son as we chased gar. 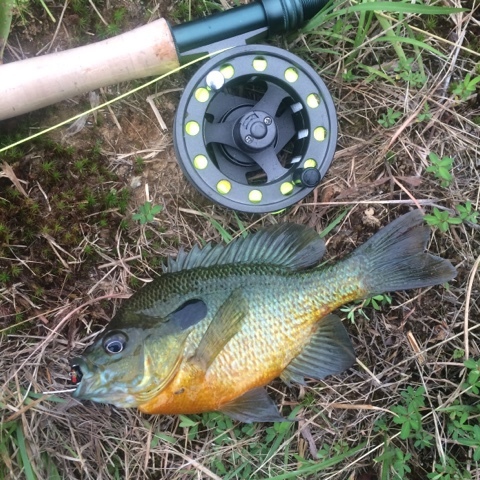 I had never targeted this species before, although I have caught a couple as by-catch when I was targeting smallmouth on the James River last summer. I went to the local tackle shop to grab the tackle needed and ran into fellow Hobie Fishing Team member Grant Alvis. He and his fishing buddy Josh having been laying waste to the gar recently, so I knew he would help me get the right stuff. We launched late in the day and made our way out looking for bait. The rigs were simple - I carried two spinning rods - a Bull Bay Spectrum Inshore Professional and a Tactical Series Black Ops Inshore. A simple float and baited hook rig was the setup of choice. As we pedaled out with both of our sons chatting at each other, we noticed a nice bait ball ahead. Joe readied his cast net and literally dropped it right over the side and hauled in a few shad we could use. 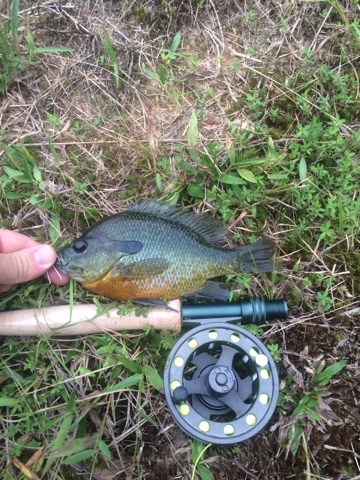 He landed so many on the first cast that we actually threw most of them back. We made it to the spot and dropped lines in. Shortly after we setup, Joe's son hooks up with a nice 41" citation gar. A little after that, one of our rods get bit and the bait starts tearing away. When my son went to set the hook, the line came free. 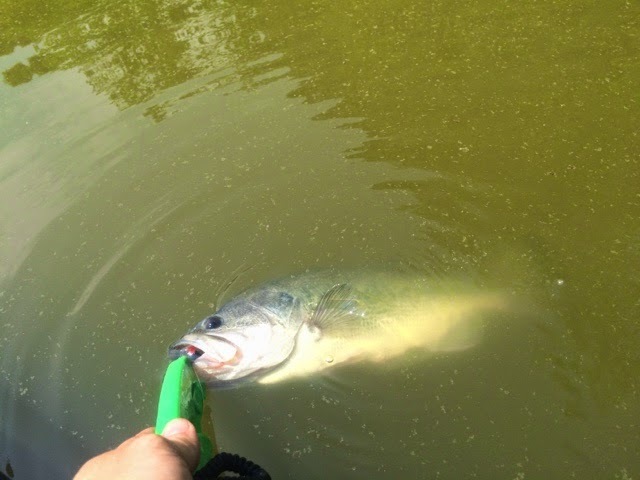 The leader had been cut, most likely by a passing gar getting the line caught on its scales and not a true hook set, because the bobber floated up a short while later and we were able to retrieve it. After a bit longer, I re-baited my line and made a cast to the drop off. Before I even closed the bail, the line took off running. 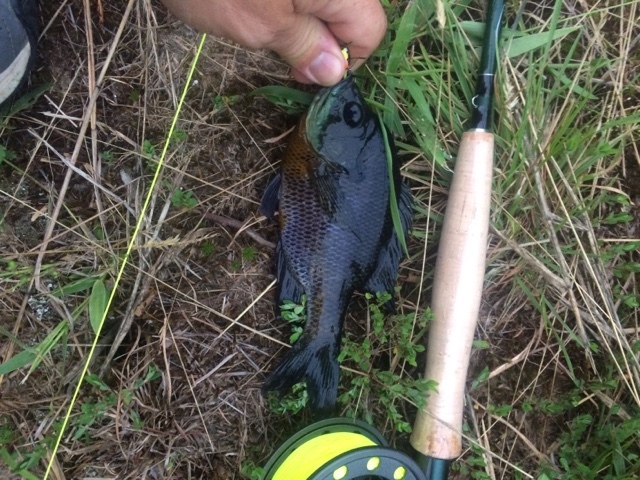 This time I raised the rod high to make sure the line wasn't snagged on its body. After about a minute run, the fish stopped, so I handed the rod to my son and let him set the hook - FISH ON! The gar started running in earnest and ended up turning us around in a complete 360. After close to three minutes, the gar was finally surfacing and ready to land. As I went to grab him behind the head, I could see how big this one was. Just as I grabbed it and started to lift, he thrashed and spit the hook somehow. It was a surefire citation, but I somehow didn't have a good enough hold on it to get it into the yak and it swam away. On the day, we had three runs - one break off, one escape and one that I didn't let take the bait long enough. Joe and his son managed five I believe - two landed and three that got away before landing them. It was fun indeed having never targeted this species before, but I can assure you I will be back to chase these living dinosaurs again! 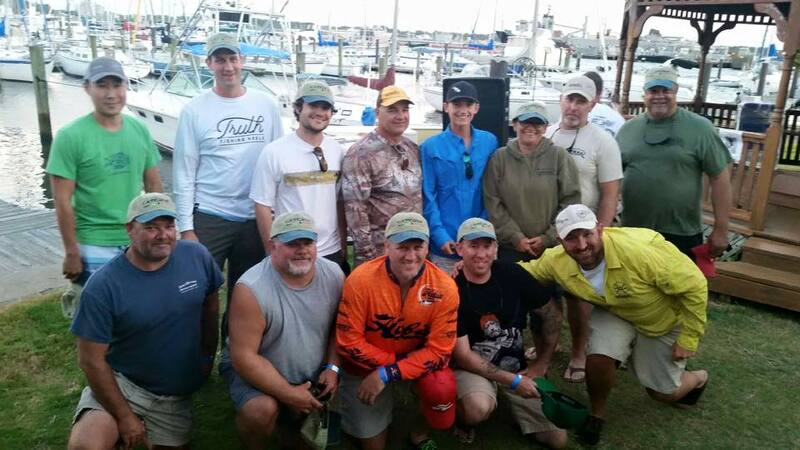 Next up for me though is the 11th annual Tidewater Kayak Anglers Association tournament benefiting Heroes On the Water and Project Healing Waters. 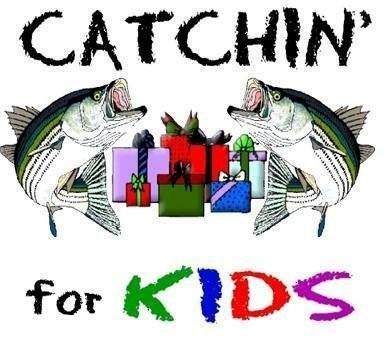 Tight lines and remember to take a kid fishing! 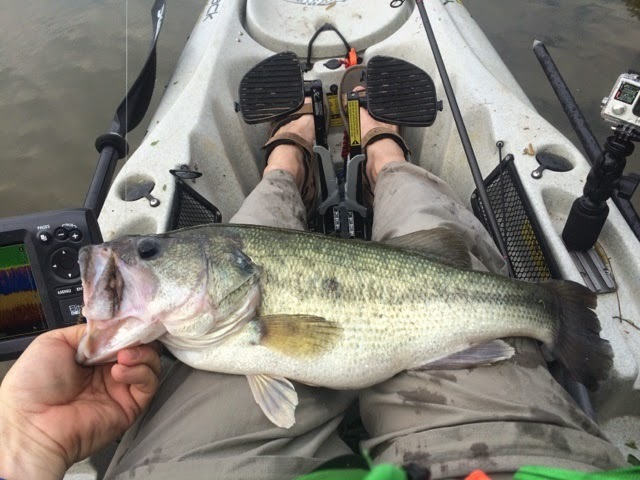 After years of fishing both in and out of the kayak, I can now say I have caught a freshwater citation in the state of Virginia. The last three years have seen several bass each year fall short of citation by the narrowest of margins. Well, the wait is finally over! 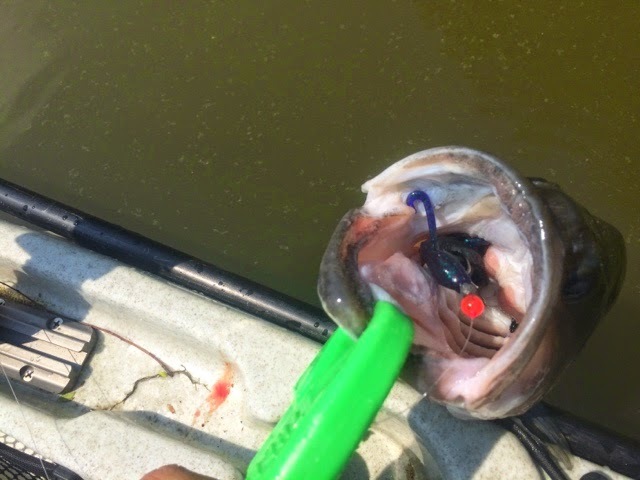 The best part of it all was that I caught it using my favorite frog lure of all time - the Capt. Ken Daubert Clone Frog, this one was the #4 Brown Spotted Bull pattern with some hand drawn black sharpie markings on the legs and underbelly by yours truly. 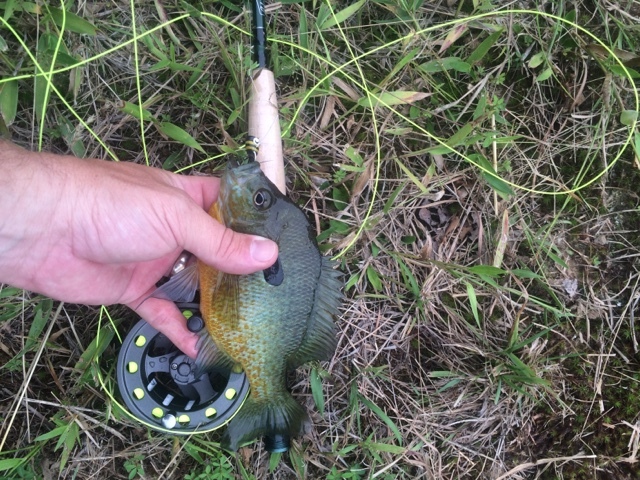 I also was using my latest "arrow in the quiver" - my new custom medium heavy Bull Bay Rod. And to complete the trifecta of good vibes, I was sporting my new Astral Porter water shoes. I am an avid and loyal user of PowerTeam Lures, so needless to say, the frog was touched up with a nice coat of Hog Tonic for good measure. 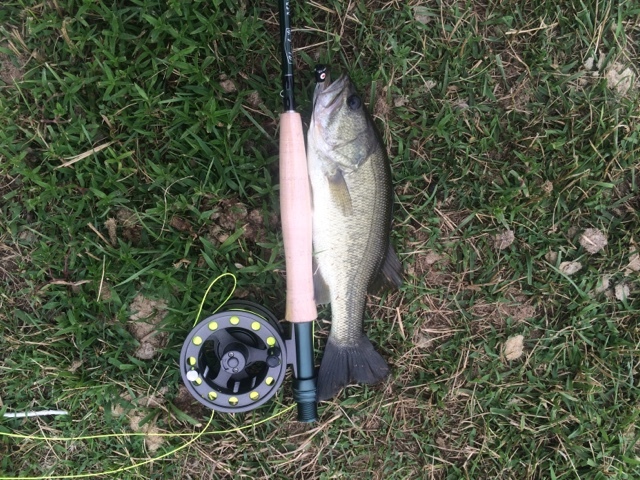 In hindsight, I realized that I had spent most of the first hour on the water trying to help my son get a top water strike and hadn't really even been casting that much. 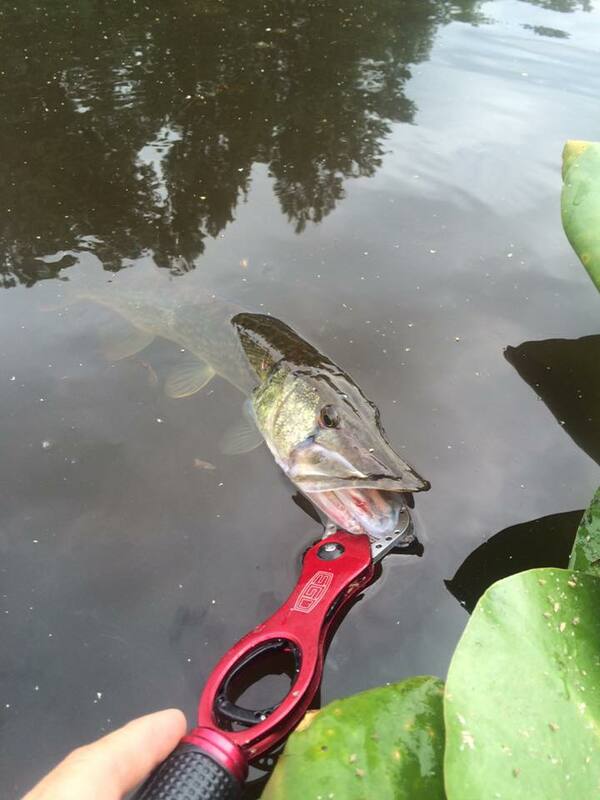 While I was coaching him up, I witnessed a bass launch out of the water chasing a small pumpkinseed. I quickly cast my Clone Frog well past the spot and slowly worked it. When the strike happened, it was even more violent than the breach I had just witnessed. At first I didn't even realize how big she really was until I brought her alongside my Outback. That's when I knew, it was going to be long enough. When I finally got her on the measuring board, I let out a guttural scream of "Yes! Finally!" 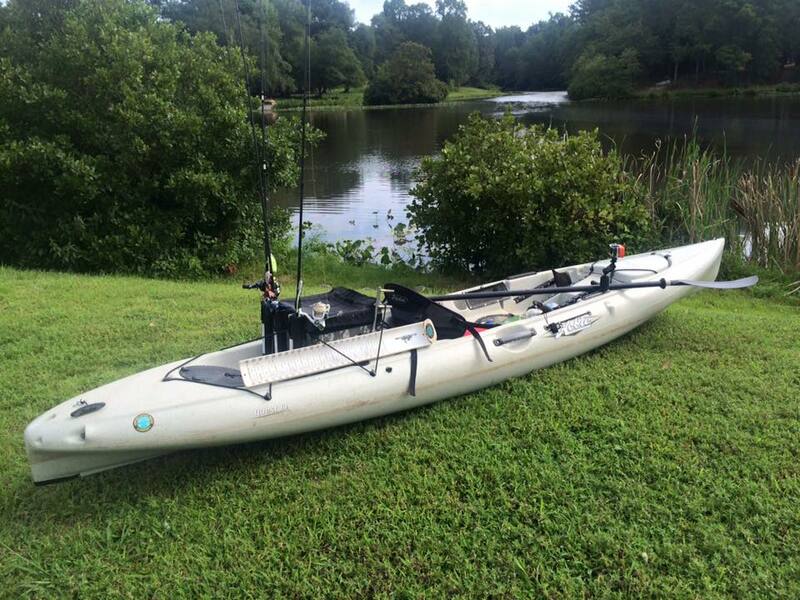 Thanks again to Hobie for designing my favorite fishing platform - the Hobie Outback. Thanks to Astral Designs for the killer new shoes and fish catching mojo. 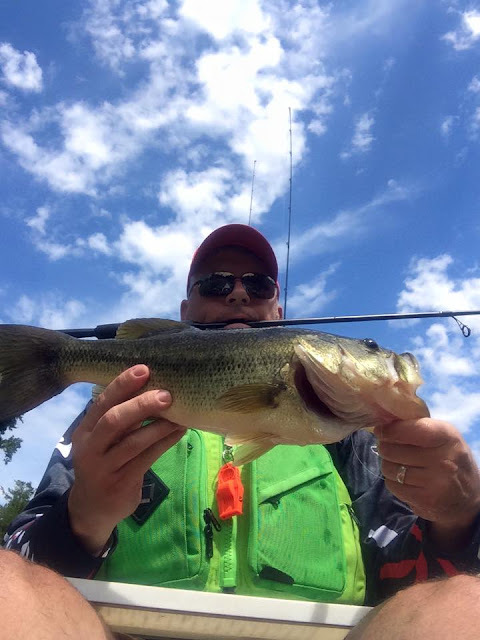 Thanks to Bull Bay Rods for building the best custom rods on the market - the new rod definitely had no problem at all handling that beastly bass! 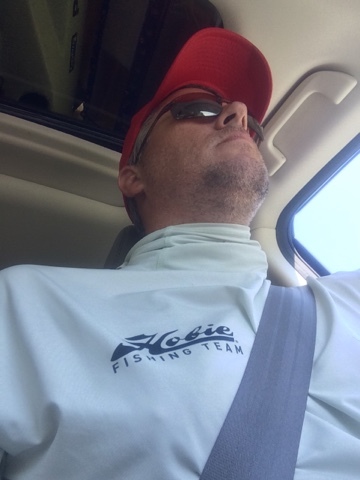 Thanks to AFTCO for the extremely comfortable Fish Ninja technical shirt you provided for members of the Hobie Fishing Team. And last but not least, thanks to Capt. Ken Daubert for designing the best frog lures on the market! I'm proud to use your frogs as the only frogs in my arsenal. Since I started using your Clones three years ago, all of my other frog lures have sat in a tackle tray collecting dust. 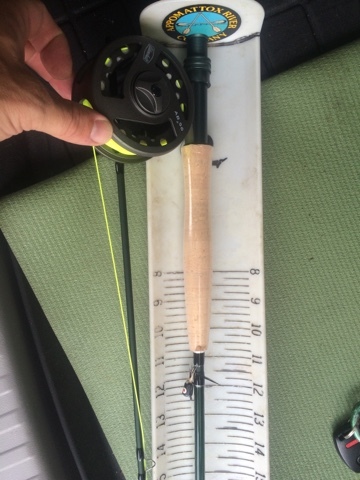 First, trying to cast a fly rod in the wind is frustrating! Second, trying to cast a fly and retrieve it through lily pads is almost as frustrating! The first pic is for size reference, since I was bank fishing due to pending storms. I think I'm getting the hang of this fly casting to some extent though. There is no greater sensation of pride in a father than seeing his own son succeeding using the techniques and teachings passed down over the years. 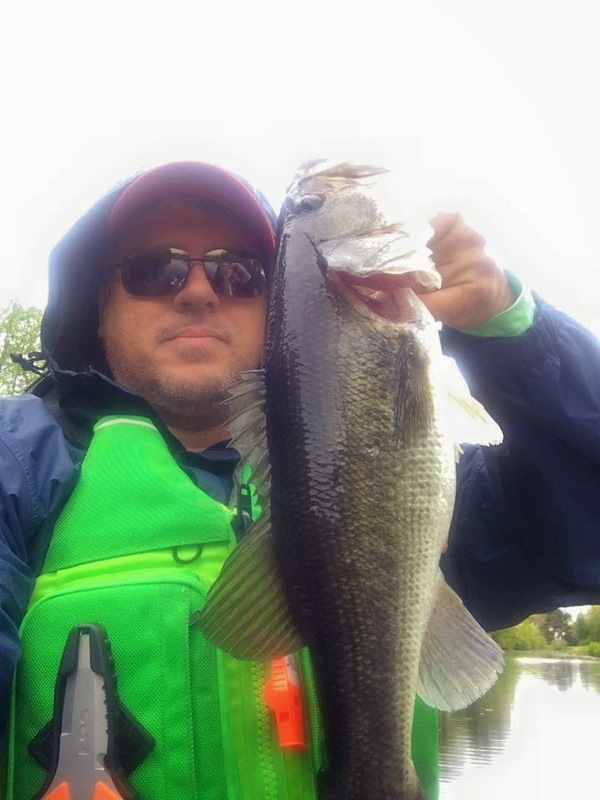 My son and I participated in a Heroes On the Water mini-event this past weekend where we helped a local veteran out by taking him out for the day and putting him on some fish. That in and of itself was fulfilling in its own right, but my son's day on the water was the icing on the proverbial cake. In the past, my son has lost patience when fishing for bass and the bite is slow. 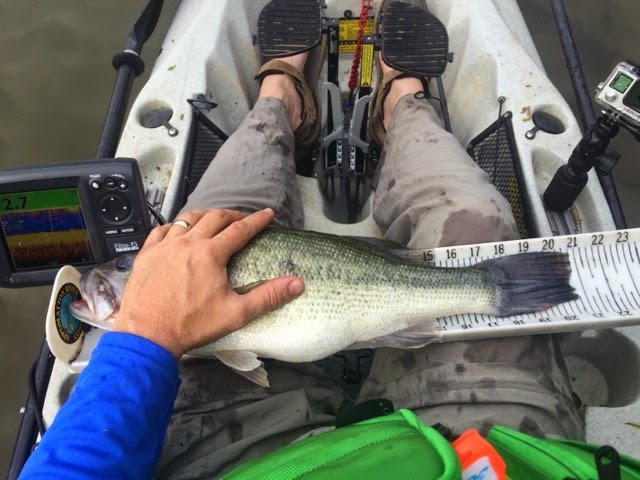 I sent him out in our new Hobie Quest 13 armed with a YakAttack 8' Parknpole and two Bull Bay Rods - one rigged with a 5" PowerTeam Lures Finicky Tickler and the other rigged with a PowerTeam Lures Jacked Whacker jig head and a Sick Stick. After a few minutes giving him pointers on how to work each lure and showing him what each lure looked like underwater when worked, we ventured into a protected cover where our good friend Chip had told us there were fish. We made our way into the cove and proceeded to stake out and work the area slowly and methodically. He spotted a tree limb sticking up in the shallows and knew there was a good chance at a fish being nearby. He cast the Sick Stick near the shore and slowly twitched it and let it fall, a couple more twitches and the fight was on. 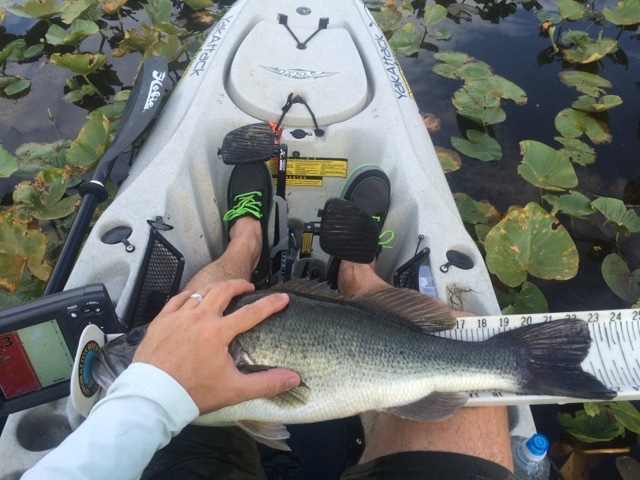 He worked the feisty bass away from the cover and got him into the kayak. I myself was in the middle of photographing my own fish, but I put the fish on the FishGrip in the water and made my way over to him to help him. 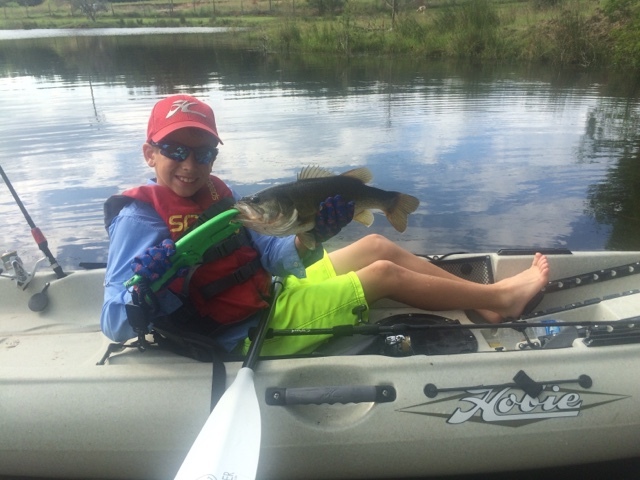 Little did I know that my son had just caught a nice chunky Largemouth Bass that would end up measuring out at 17 3/4" for his new personal best! The winds were up for most of the day with a storm front moving in later in the afternoon. We spent the day working every type of contour change, lay down, rock pile and grass line we could find. The bite was tough and only got tougher as the day wore on. At one point, the winds were so strong, I had to move us into some shallow flats, so that my son could stake out and wade for a bit. 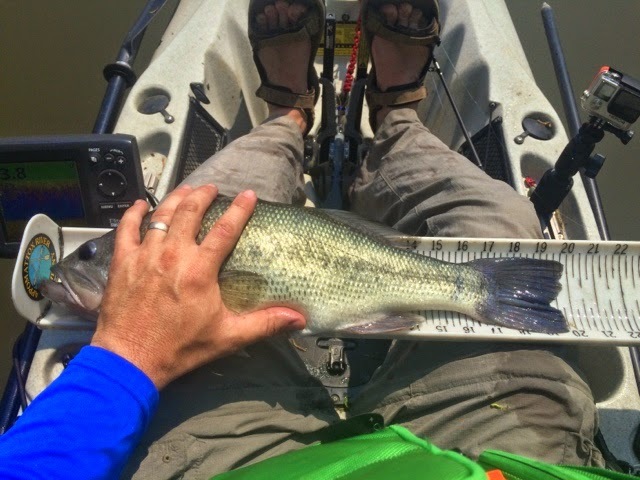 Even though the bite was slow, he had a few bites that came unhooked as he attempted to put the fish in the boat, including his last fish of the day that was a feisty chain pickerel that was easily over 20" that spit the hook as he was lifting it into his foot well. All of us saw him fighting the fish and can attest to the size of it. He was bummed, but we all encouraged him letting him know that chain pickerel are notorious for that! He only managed to get two bass for pictures, but it was a success in my book. 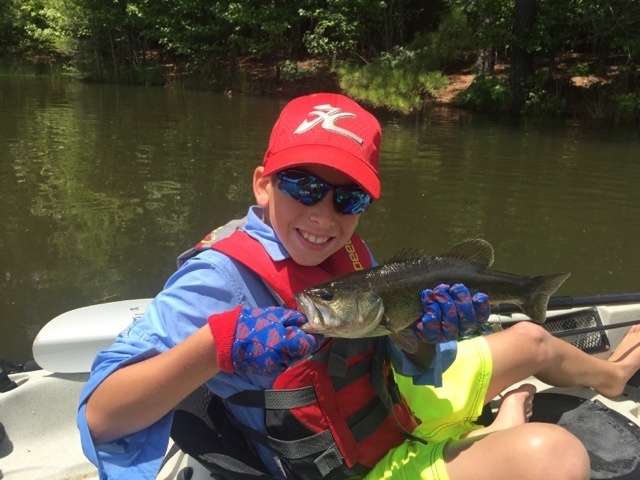 My son fought through the doldrums of the slow bite, kept his focus and caught fish by staying persistent and determined through it all. Sometimes you have to trust your instincts and just do it - so I did! I took a vacation day mid-week and went fishing. The weather window was favorable for a change, and I didn't have a single meeting or task due at work the following day. No brainer! The arsenal for the day was the same rod selection from last week but the lures of choice were different due to stained water conditions. 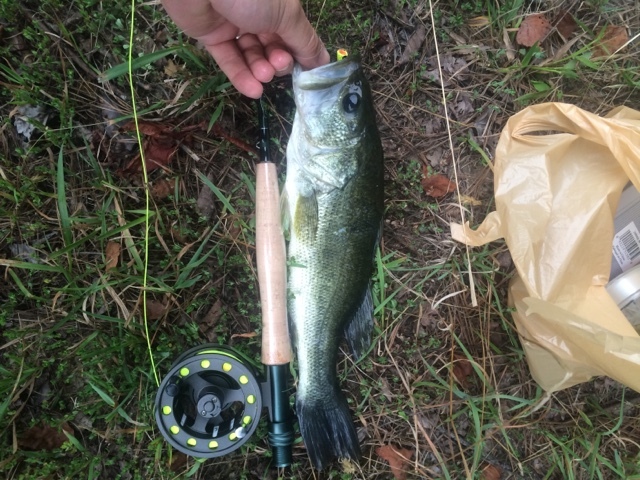 I tried a couple lures in lighter colors (a vibrating jig in chartreuse/white tipped with a PTL Grub and a PTL Sick Stick in Pearl) but the water clarity was less than 6". 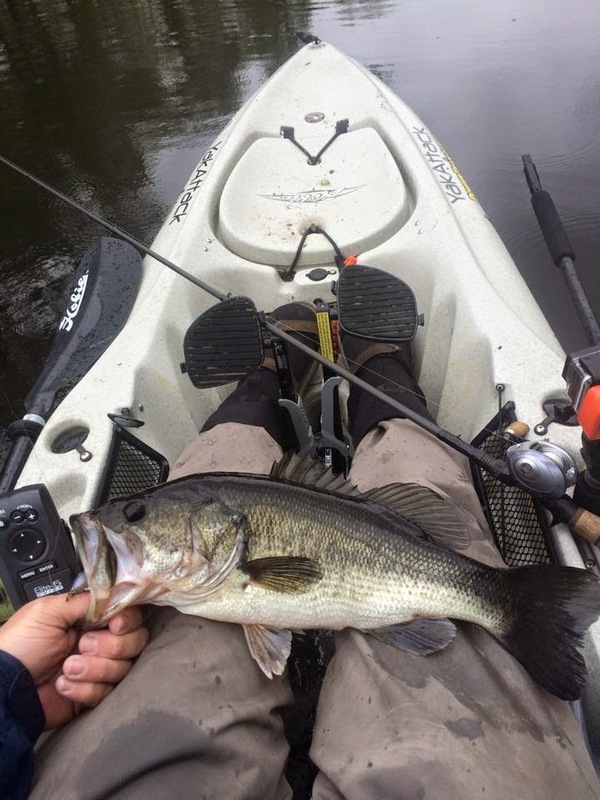 So, I switched out to a PTL Sick Stick in Okeechobee Craw and a PTL Gator in Junebug. 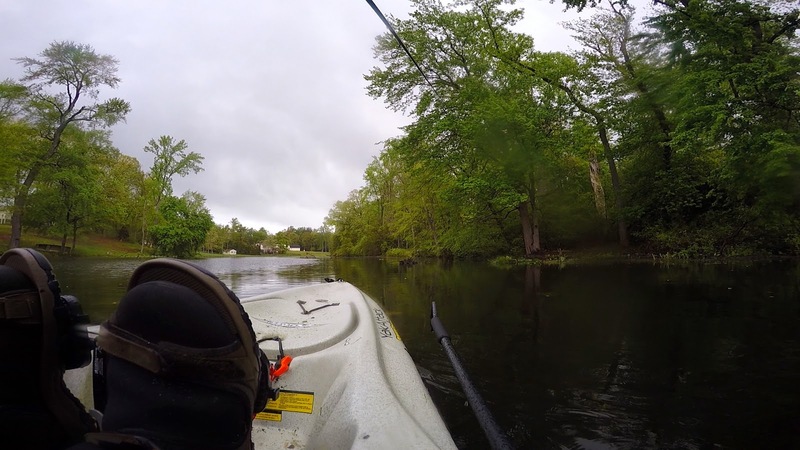 This pond is mostly flat with an average depth of 4' and a multitude of overhanging brush and trees with several laydowns and brush piles from trees and brush that have fallen into the water over the years from strong storms. With the water clarity as it was, you are forced to slow down and work literally every square inch of an area. I come here a few times a year to simply hone my skipping and pitching/flipping skills. The added bonus is that there are some fat bass lurking about and always manage to give me a nice fight. It took a couple hours to find some takers but I finally managed to get into a few managing only three on the day and missing a few as well including one pesky bass that managed to break me off not once, twice but three separate times! The first bass of the day was the best and measured in just shy at 20.75" and was very fat and rather perturbed that she was caught. 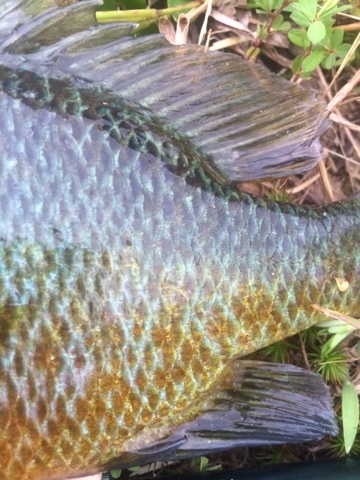 I had skipped my cast to a cut in between two big bushes and was met with a violent strike as the lure hit the water. This big girl hit the Sick Stick so hard and fast that I barely managed to get the GoPro turned on in time to catch the last few seconds of the fight. When the Sick Stick found no more interest, tried using a heavy tungsten pitching weight to punch through pockets of thick brush with a PTL Gator but to no avail. Flashback a few hours earlier to the point of loading my gear for the day. I stood there in my house looking at my gear and made the conscious decision to leave my terminal tackle tray thinking I would not need it - big mistake. I'm sitting there in my Hobie Outback cruising about and chastising myself for not having different rigging options. As luck would have it, one of my casts became entangled with a previous anglers broken line. I cleared the tangle and found a busted bobber and hook at the end along with a small split shot on the line. "DING" lightbulb moment. I cleared the tangle, removed the split shot and rigged up a simple split shot rig and a texas-rigged PTL Gator. Apparently, it was the right decision. Not five minutes later, I noticed my line swimming towards me but felt no hint of a fish. I reeled in the slack and swung for the fences - hook sets are free right? 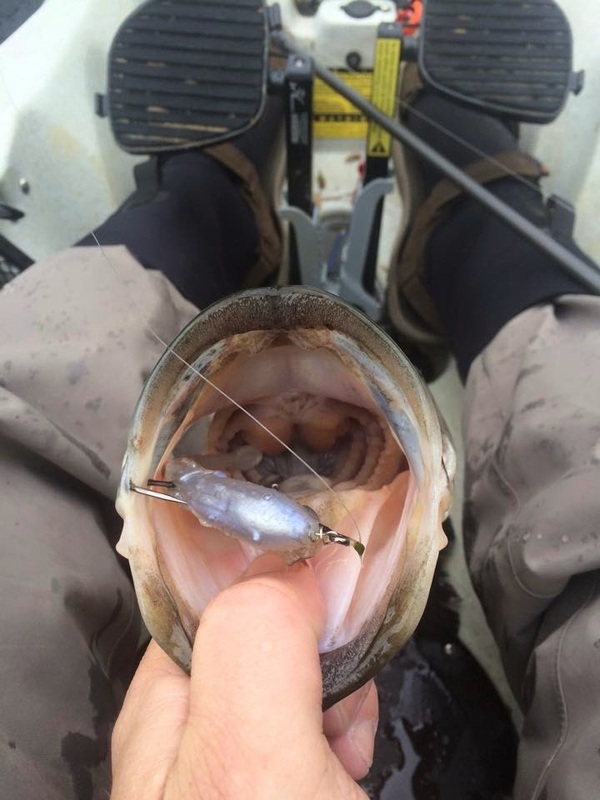 I was rewarded with another angry female bass that was none too pleased with her predicament. After a brief fight, I brought her in and measured a healthy 19.75". She must have really liked that PTL Gator because she choked it! 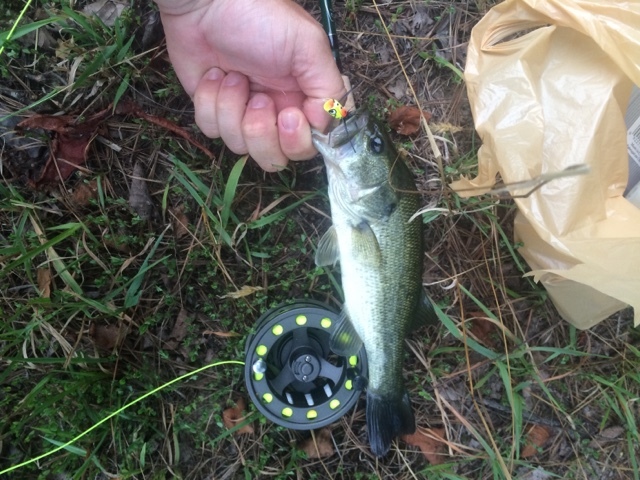 The last bass of the day was nothing to brag about but confirmed to me that the bite was over for the day. A slow but productive day away from work. 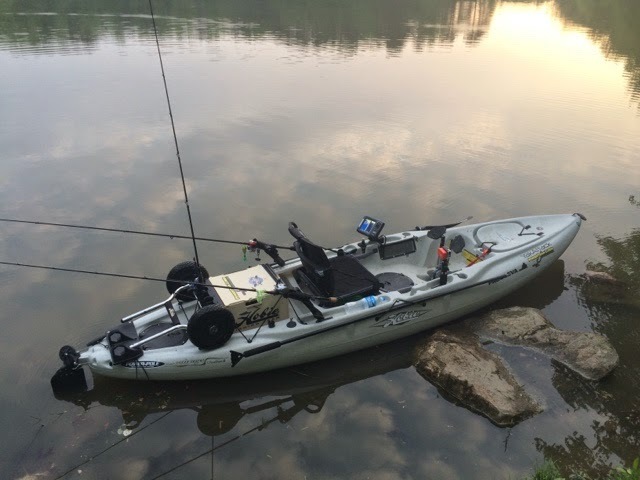 Tight lines and stay safe! The first two are confidence baits for me, but I have to confess that I have never even tried a Carolina Rig in freshwater for bass prior to this day. I launched fairly early in the morning in a light drizzle and stared with the Hammershad first to see if I could get a reaction bite. 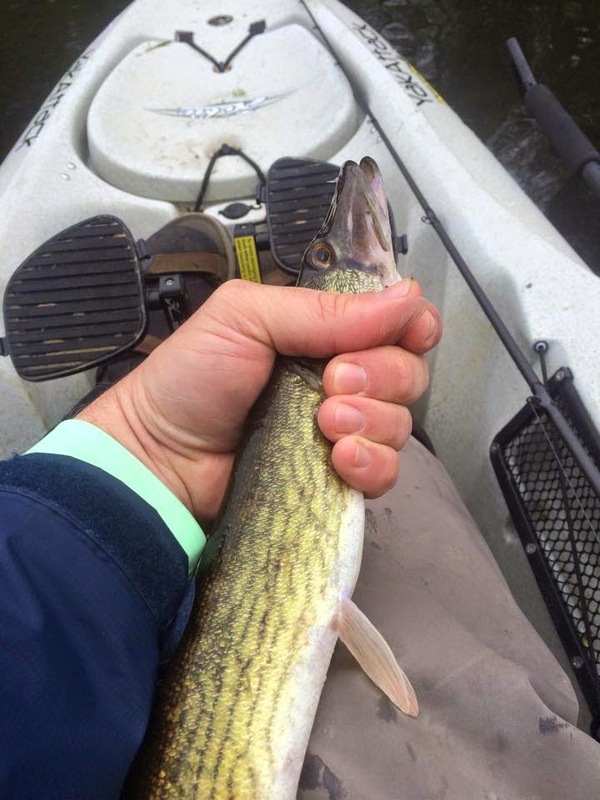 Within 30 minutes, I had my first fish - a slimy 18" Chain Pickerel, followed by a shortish 14" chain pickerel a few minutes later.